The system features two independent LVDS channels for dual LCD displays and one VGA port for external monitor connection. The multimedia and graphics engine of the i.MX537 supports OpenGLE 2.0, OpenVG 1.1 graphics acceleration and 1080p video decoding. In addition to the multimedia features, the M-5360A provides powerful communication functionality such as Ethernet, RS-232, RS-485, CAN 2.0, 1-Wire and USB. This makes it suitable not only for multimedia applications but also for embedded networking. 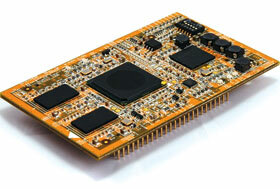 The board uses reliable 128-pin 2,0 mm pin headers to allow users to design their own application board. Supported and pre-installed operating systems include Linux, Android and Windows CE. In addition to the hardware building blocks, software utilities and device drivers are available for users’ applications.